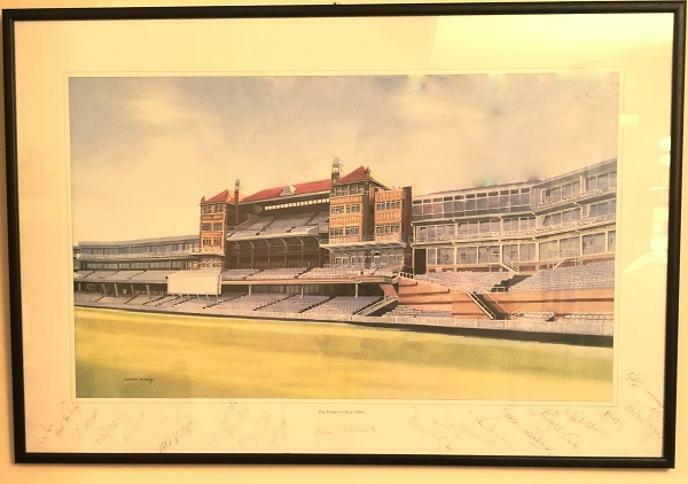 Original painting given by the artist to Nelson Mandela on his visit to The Foster's Oval in 1994. 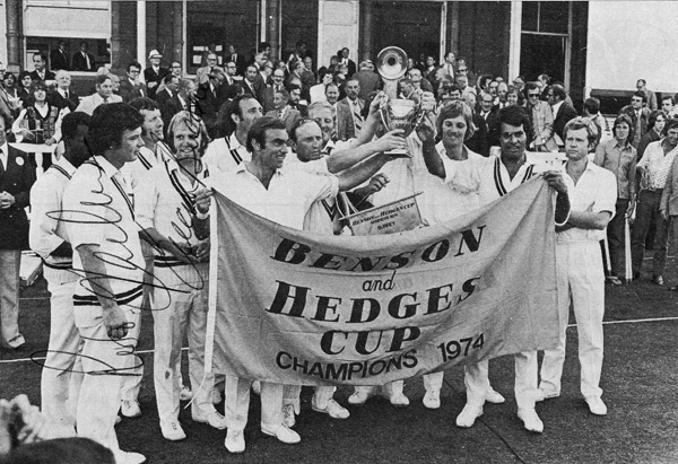 1974 Benson & Hedges Cup Champions. 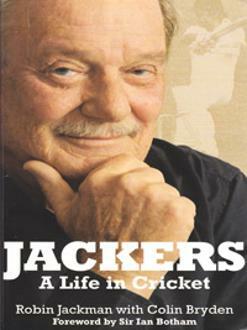 Storey, Jackman, Butcher, Pocock, Arnold, Long. 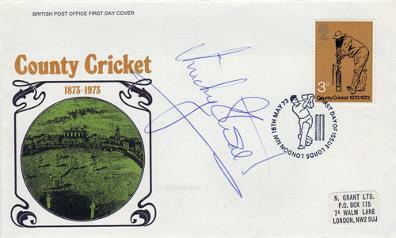 v Worcestershire CCC on June 12 1977 at the Oval. 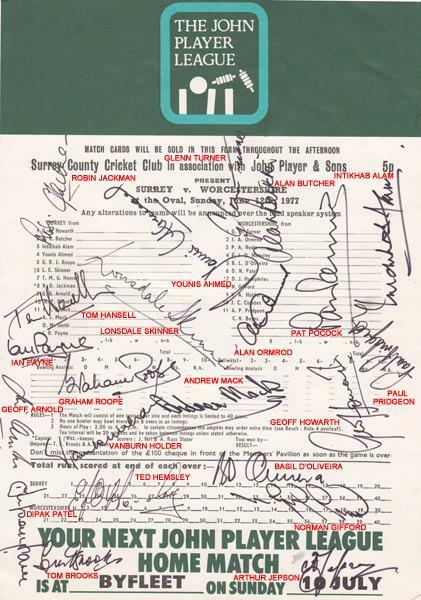 Younis Ahmed, Alan Butcher, Pat Pocock, Alan Jackman, Intikhab Alam, Tom Hansell, Graham Roope, Geoff Arnold, Geoff Howarth, Ian Payne, Andrew Mack plus Worcs players Glenn Turner, Norman Gifford, Ted Hemsley, Alan Ormrod, Vanburn Holder, Basil D'Oliveira, Paul Pridgeon, Lonsdale Skinner, Dipak Patel and umpires Tom Brooks & Arthur Jepson. 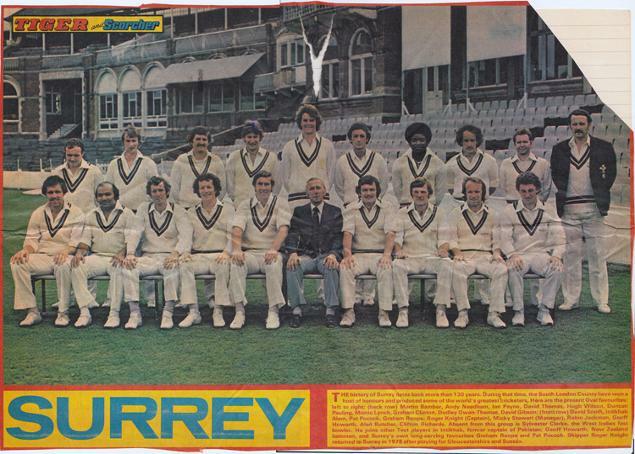 Tiger & Scorcher Comic double page spread of the 1978 Surrey CCC first team squad. 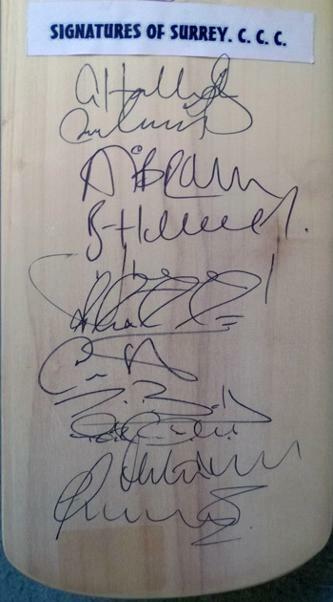 Alan Butcher, Graham Clinton, Monte Lynch, Pat Pocock, Geoff Howarth & Micky Stewart. 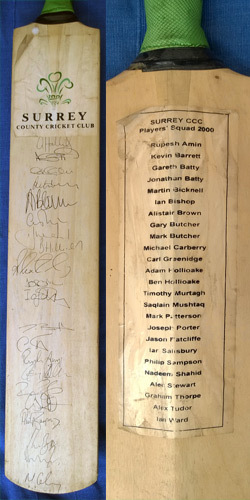 Official Surrey CCC Cricket Bat signed by members of the 2000 County Championships winning squad, including Adam Hollioake, Ben Hollioake, Mark Ramprakash, Alec Stewart, Alec Tudor, Saqlain Mushtaq, Mark Butcher, Graham Thorpe, Jonathan Batty, Alistair Brown, Martin Bicknell, Michael Carberry, Carl Greenidge, Tim Murtagh, Ian Salisbury & Ian Ward. 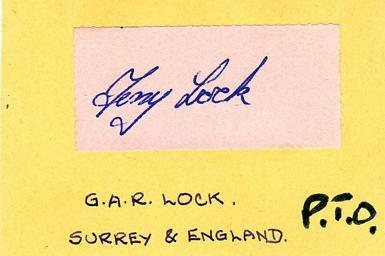 Rubber handle grip has perished. 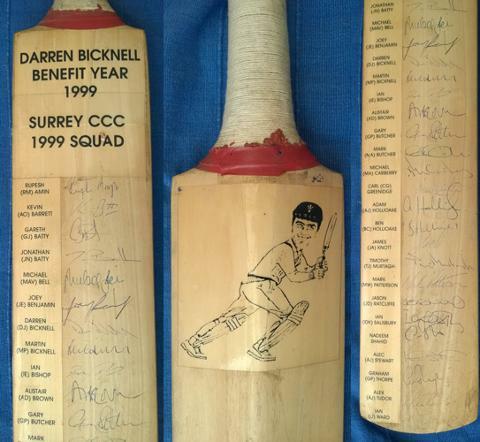 Official Surrey CCC MINI Cricket Bat signed by seven members of the 1999, 2000 & 2002 County Championships winning squads. 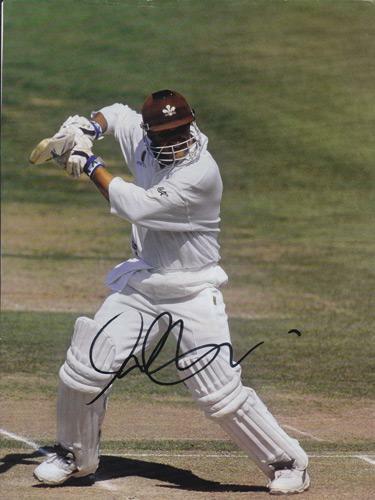 Darren Bicknell, Martin Bicknell, Joey Benjamin, Gareth Batty, Jonathan Batty, Ian Bishop, Alistair Brown, Mark Butcher, Michael Carberry, Adam Hollioake, Ben Hollioake, Tim Murtagh, Ian Salisbury, Alec Stewart, Graham Thorpe, Alec Tudor & Ian Ward. 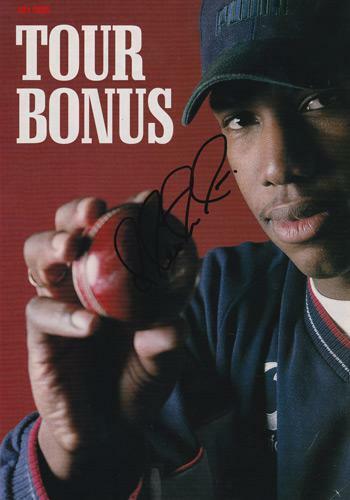 Benefit caricature sticker on reverse of bat. 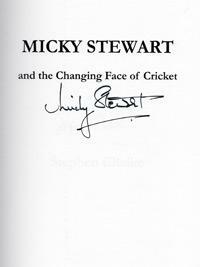 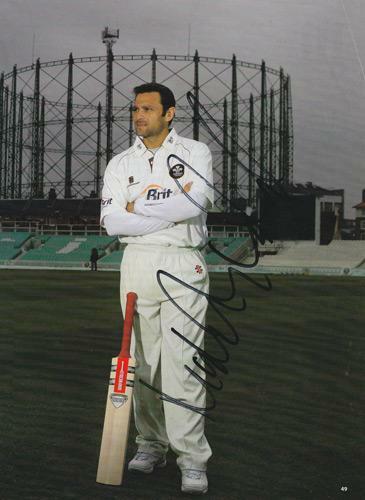 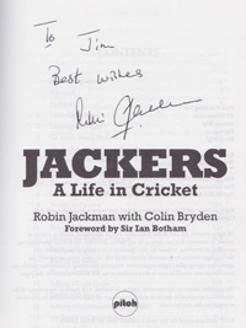 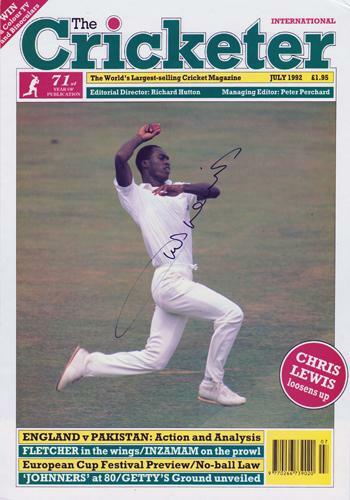 Signed Oct 1990 "The Cricketer" magazine cover photo. 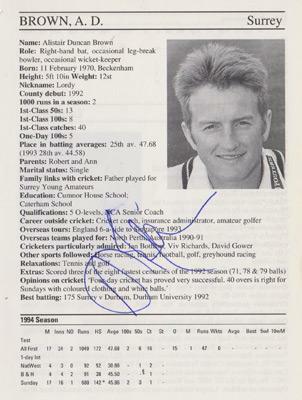 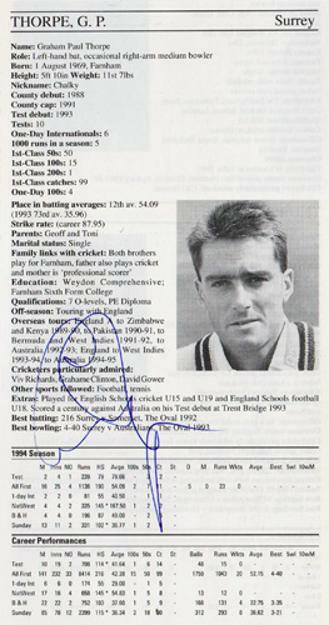 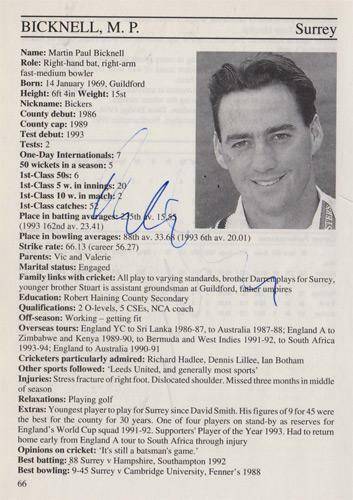 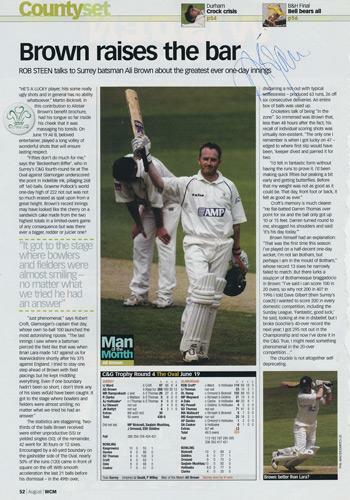 Signed Wisden Cricket Monthly page Surrey county feature with colour pic of Ally Brown. 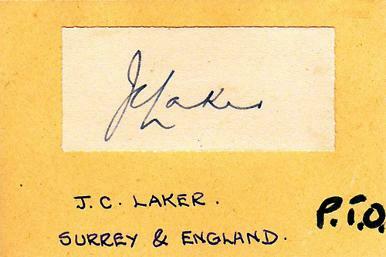 Autographed Surrey & England cards - back to back (c. 1960). 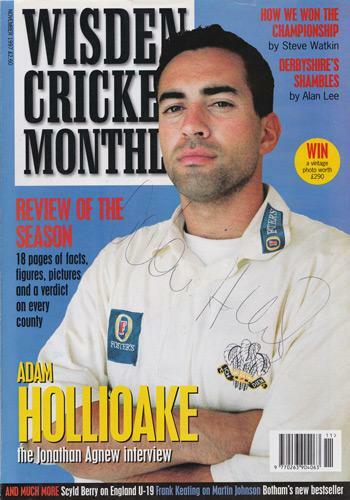 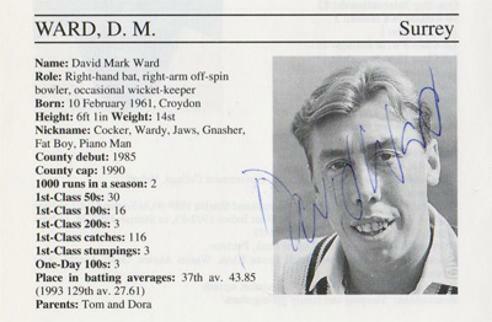 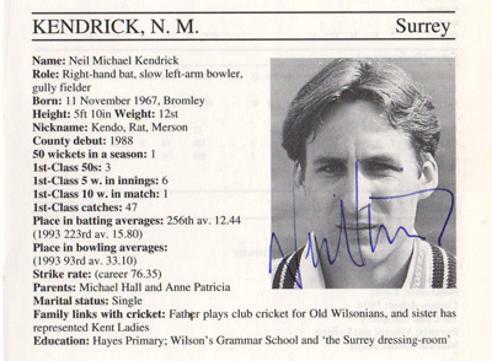 Signed July 1992 "The Cricketer" magazine cover photo. 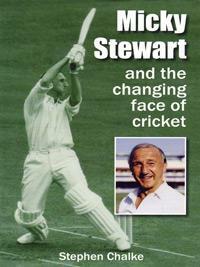 "The Changing Face of Cricket"
with a 3d stamp of WG Grace. 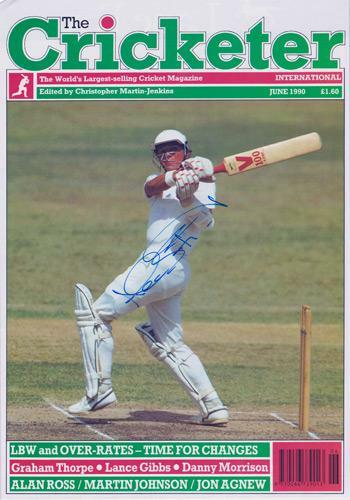 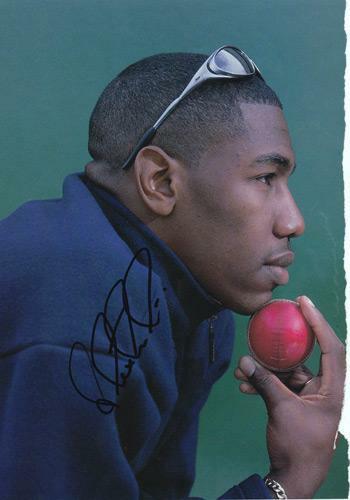 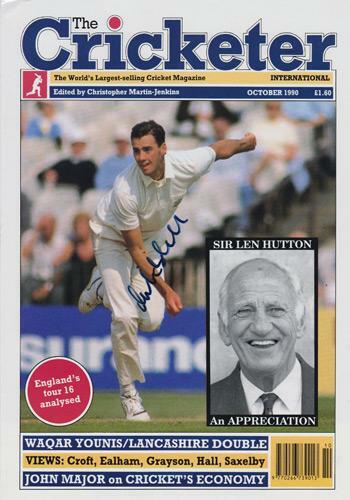 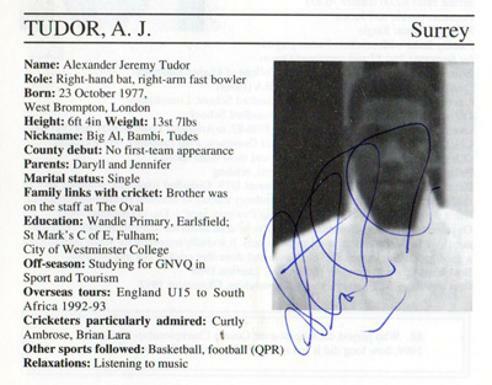 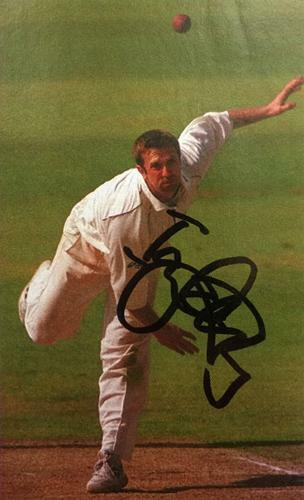 Signed Cricket mag pic "Tour Bonus"